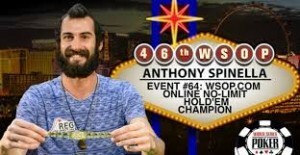 Anthony Spinella was the owner of a rather impressive poker resume long before entering the World Series of Poker’s Event #64, the tournament’s inaugural WSOP.com online bracelet. Spinella had totaled more than $650,000 in live cashes and grossed more than $4.5 million online under the moniker “holdplz” before last weekend’s July 4th tournament. The $1,000 No-Limit Hold’em buy-in attracted a total of 905 entrants to create a prize pool of $859,750, with Spinella grabbing $197,743 for his efforts. Though the vast majority of his career earnings stem from online play, Spinella says he now prefers live poker. In fact, he wasn’t even planning on playing in the online event until a friend relayed that the turnout was strong, but it was relatively soft. “It took 7 years but we finally got our first WSOP bracelet. Thank you for all the support, it never gets old 🙂 happy fourth-Safe celebrating,” Spinella tweeted. Of course, the first-ever WSOP.com online bracelet wasn’t entirely online, as the final table was played live at the Rio following a one-day break in play for competitors to travel to the casino. That was likely an appealing format for Spinella, a player who made his millions online but is now focused on live play. His winning hand came on the 82nd of the final table after he shoved all-in with J♠ 7♥, with his heads-up competitor Hunter Cichy calling with Q♥ 4♥. Following a 7♣ A♣ A♥ flop, K♣ turn, and 9♣ river, Spinella was your champion with two pairs. Though not everyone was in favor of the hybrid event, with some pros believing an online competition shouldn’t warrant a bracelet, poker’s most coveted prize, others embraced the concept. Greg Merson, the 2012 WSOP Main Event champion, was one player who tried the online tourney, though his luck ran short. “No luck in the online event, seems like it got a solid turnout though,” Merson tweeted. Originally from Port Jefferson Station on Long Island and now a resident of the Mexican coastal resort city of Playa del Carmen, Spinella is seemingly enjoying the best of both worlds, visiting the big marquee tournaments for live play, and living on sunny beaches the rest of the time competing online. And speaking of marquee tournaments, after more than 40 days of action, the World Series of Poker Main Event has officially begun. The $10,000 buy-in championship commenced Sunday, the first of three starting days for poker’s most celebrated and important tournament. At the conclusion of Day 1A, 741 entries had been paid, including last year’s third-place finisher Jorryt van Hoof, the commanding big stack heading into the final day of play in 2014 before being overtaken by Felix Stephensen and eventual winner Martin Jacobson. Hoof once again is off to a strong start, as is four-time bracelet winner Mike Matusow and 2010 Main Event champ Jonathan Duhamel. The reigning champ was scheduled to be present for the unveiling of his WSOP title pennant and help get the cards in the air for the Main Event, but Martin Jacobson fell ill and postponed the ceremony until Tuesday.